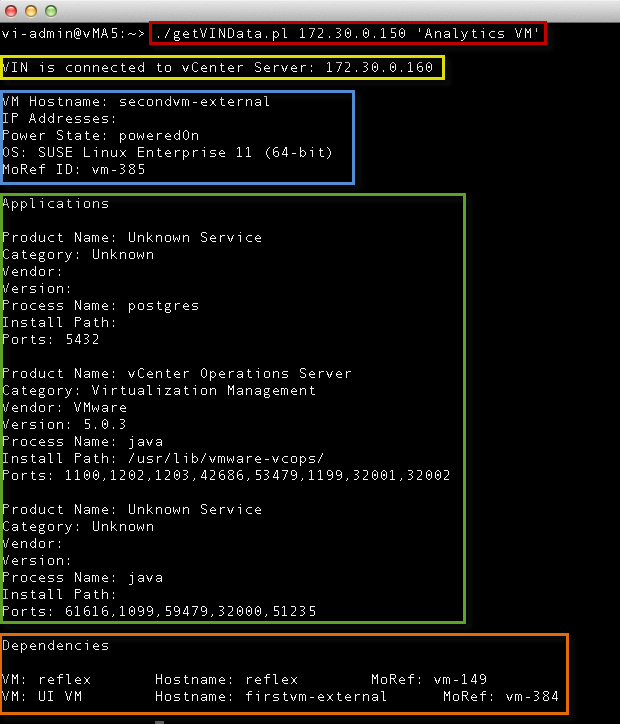 In my previous article Extracting Information from VIN (vSphere Infrastructure Navigator) Part 1, we took a look at the data VIN was collecting through an interface called Jolokia. Utilizing a tool called j4psh, we were able to easily view and explore the data in VIN remotely. In this article, we will take a look at how easily you can extract the data we explored in the previous article using a very simple script. Disclaimer: This is not officially supported by VMware, use at your own risk. Before using the script, you will need to run through the two per-requisites outlined in the previous blog article: VIN appliance setup and installation of Jmx4Perl. Once you have completed these two steps, you are now ready to execute the script (make sure the script has the executable permission set). The script is pretty straight forward it accepts two input parameter: VIN hostname/IP Address and the name of the virtual machine you wish to query. 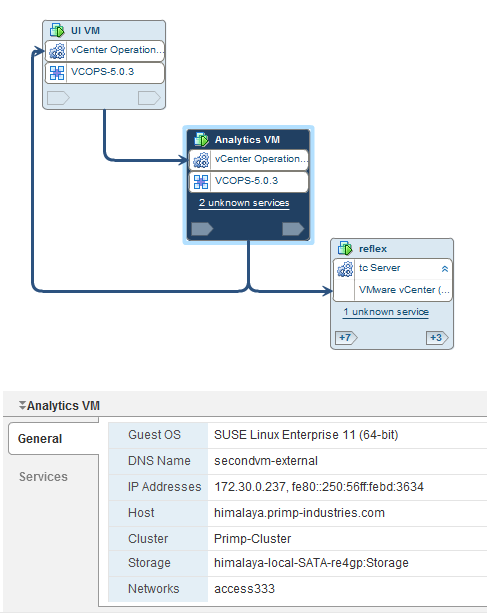 In the example below, I am connecting to my VIN host which has an IP Address of 172.30.0.150 and I am querying a virtual machine with the name Analytics VM (one of the vC Ops VMs). Though the script already contains quite a bit of information, it is just a sample of what can be done. With further exploration you can easily extend the script to extract other pieces of information and possibly even use other scripting/programming languages to connect to this interface. As I mentioned before, VIN is a very powerful tool for your vSphere infrastructure and now you can gain additional benefits by leveraging it's valuable data externally! As long as it’ll maximize the overall system of PC even if, it is not an official method used and presented by VMware it’ll be fine. I see that it could enhance and boost the data a system could hold up so perhaps, I could try this out first in my PC. Should you ever need an export of the Infrastructure Navigator dependencies then use a VROPS custom report on VM level. This can be exported as CSV and be re-used. You need VROPS Advanced to use VIN, just install the VIN management pack and create a custom View.